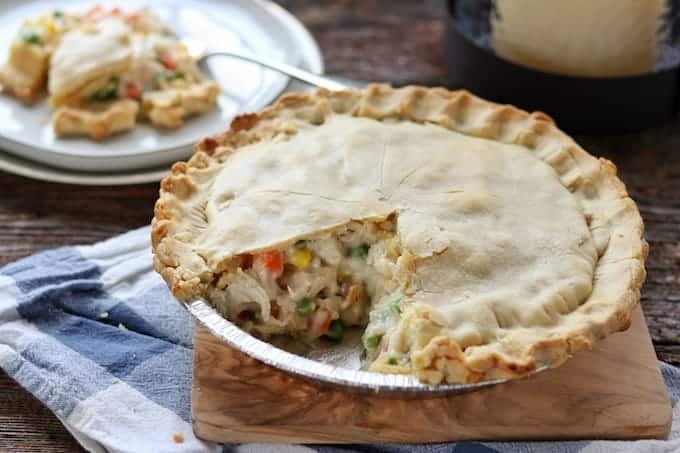 An easy chicken pot pie recipe made with pie crust which helps this deliciously warm & filling dinner come together quickly. I used to be afraid of the pot pie. It looked so complicated and the idea of making a homemade crust was too much. 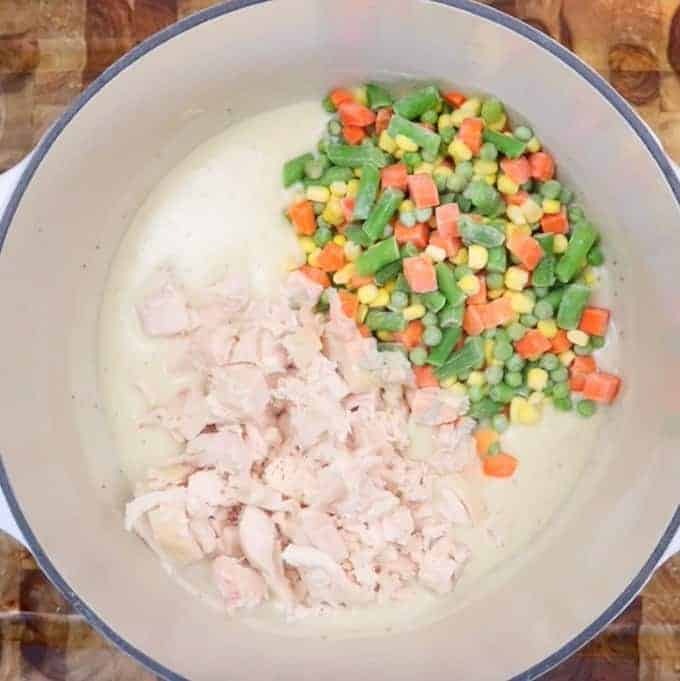 However, after my daughter kept requesting chicken pot pie as her dinner of choice, I decided I needed to tackle this classic recipe and add it the already favorite Crustless Chicken Pot Pie. I’m going to show you how easy this recipe is to make. I use store-bought crusts, but if you want to make your own try this easy and delicious recipe for Homemade Pie Crust. You can use leftover chicken, rotisserie chicken, or even canned chicken in this recipe. It would also be a great use for leftover turkey after the holidays. 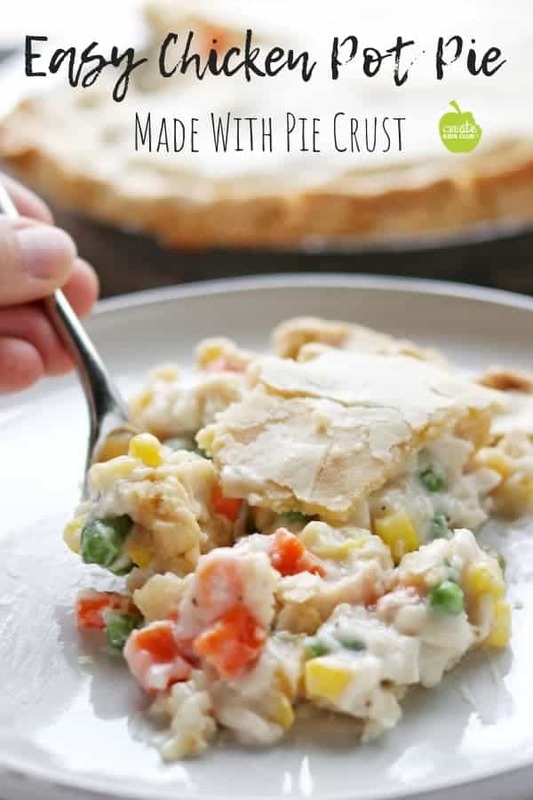 Watch the video or keep reading for step by step instructions on how to make an easy chicken pot pie with pie crusts! Over medium-high heat, melt butter. 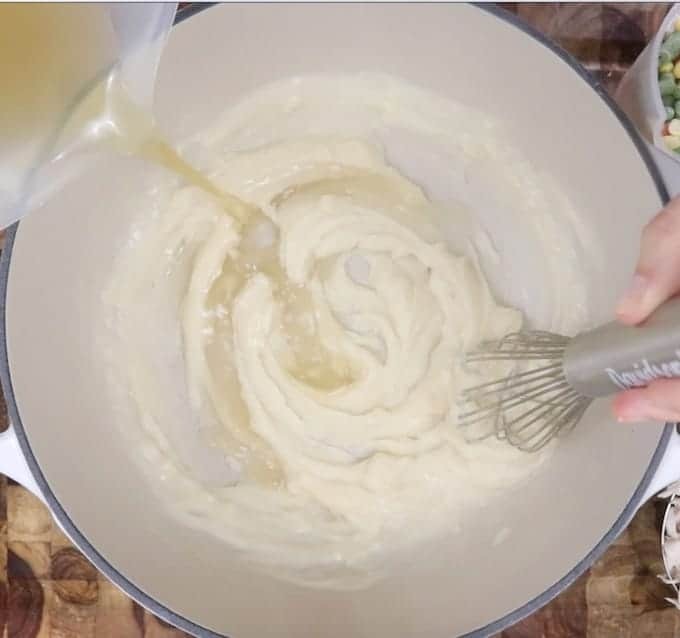 Whisk in flour. Slowly whisk chicken broth into flour mixture a little at a time, whisking the whole time, making a roux. Bring mixture to a simmer and slowly whisk milk into the roux. Stir in spices. Add mixed vegetables and chicken. Pour mixture into pie crust, top with second pie crust, pinching edges to seal. In order for the inside mixture of the pot pie to be creamy and firm, we need to make a roux. 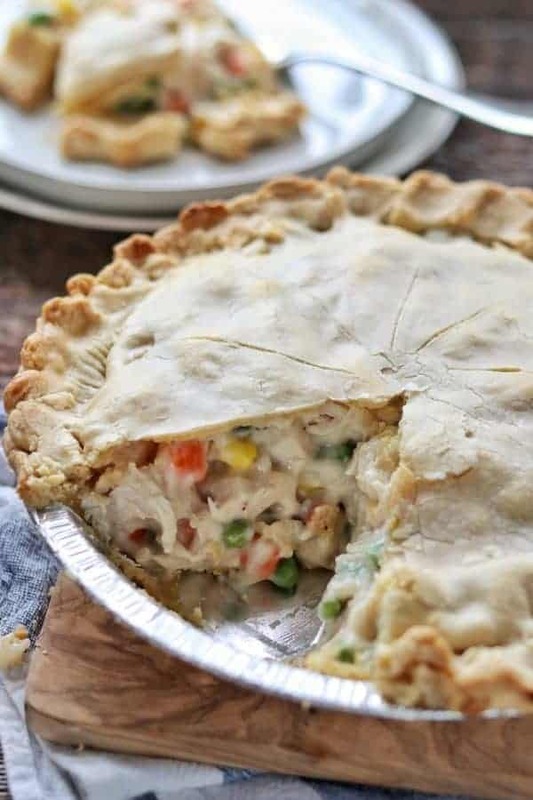 You want pot pie to stay inside the crust and not run out as soon as you cut it. 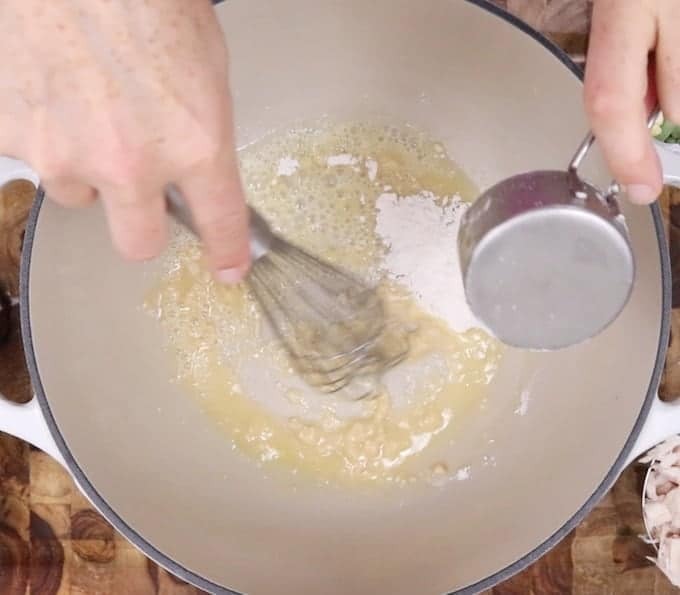 Pro Tip: A roux is simply a mixture of a fat and flour that works to thicken sauces. Start by melting the butter (don’t have the pan too hot or you can burn the butter). Whisk in the flour. Your mixture will be very thick – not to worry – you’ll be adding broth the even that out. 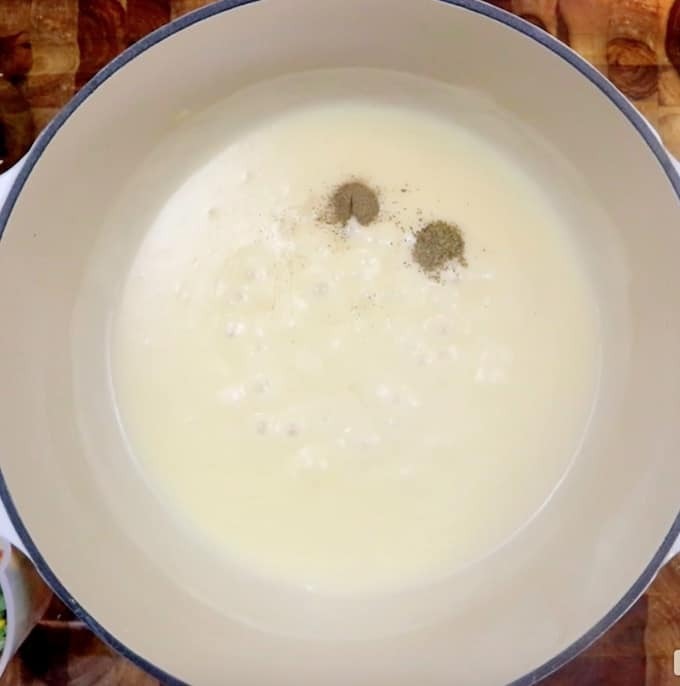 Kitchen Tip: Don’t add all the broth at once, slowly add it to the flour and butter mixture, whisking and bringing the temperature of the mixture back to a simmer before adding more broth. After the broth is added and simmering it’s time to add the milk. You can use any kind of milk you have in the house, I used 1%. The same rules apply here. Slowly whisk in the milk allowing the temperature to come back to a simmer before adding more. 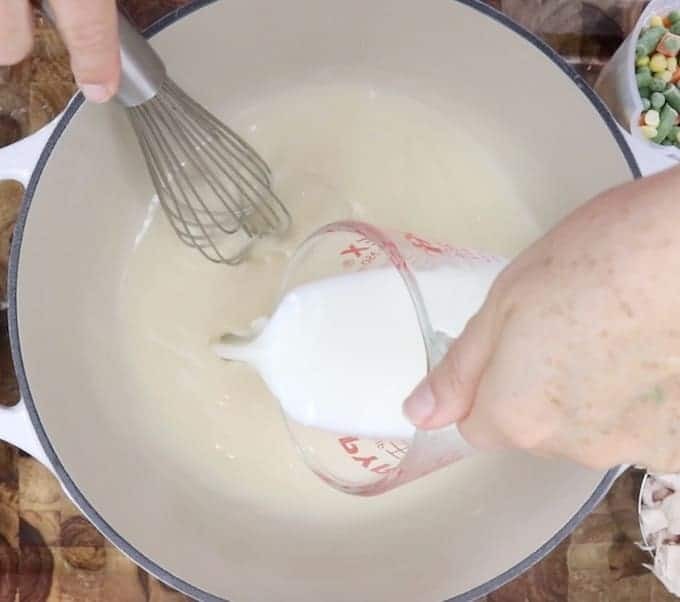 When you’re done adding the milk the mixture should be very creamy and not runny. If your mixture is not as thick as you’d like, continue to simmer for 5-10 minutes to let the flour fully thicken. If that doesn’t work you use other thickeners to help. Pro Tip: My quick fix to thicken sauces is to use potato flakes. They thicken quickly and add a nice flavor. You can also make a cornstarch slurry by mixing 1-2 tbsp. cornstarch with small amounts of water until you have a runny mixture. Whisk this into the roux and your sauce should start to thicken. 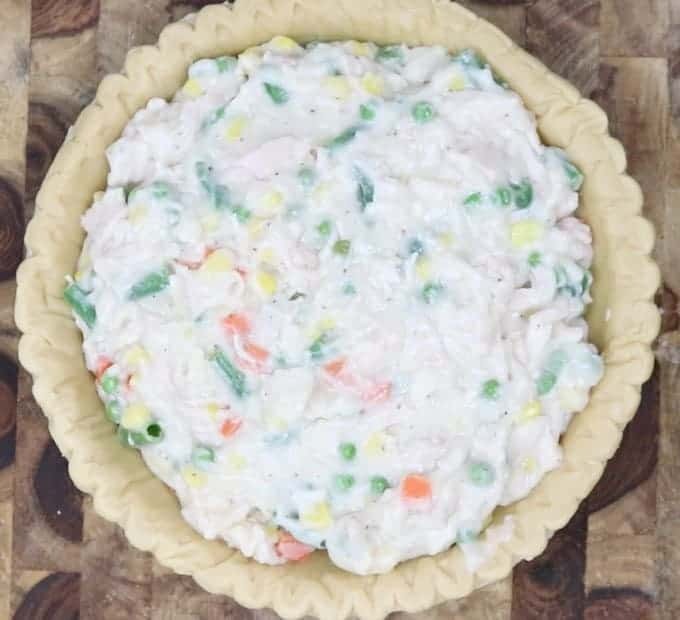 If you don’t have celery seed simply skip it, but it does add a nice flavor to this easy chicken pot pie recipe. Next up is the mixed vegetables and diced chicken. I use frozen veggies but you could use canned veggies or fresh. If using fresh, either chop them very small or give them a quick steam to soften them up. Kitchen Tip: When you have leftover chicken, dice it and freeze in individual ziplock bags to grab and use in recipes like this one. 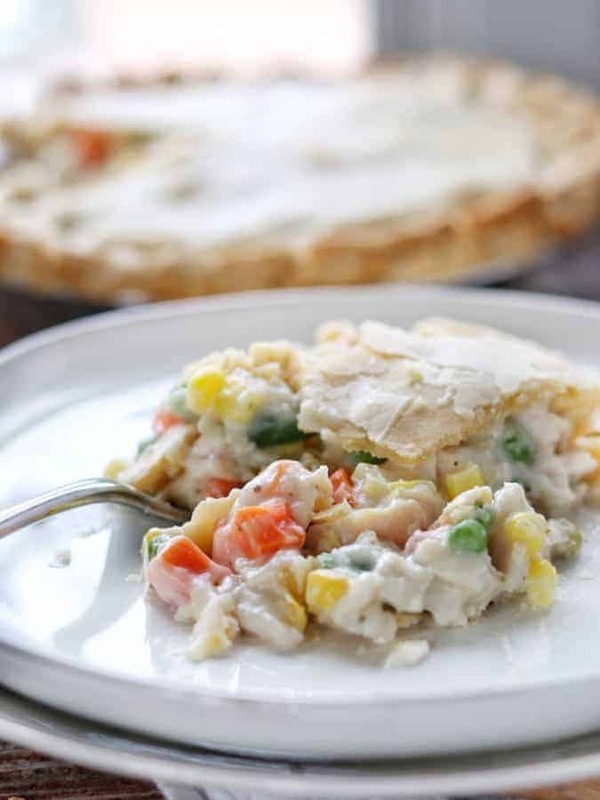 Add the vegetable mixture to your premade pie crust. I could only find the pie crusts already in a pan, but I also like using the roll out kind. Either works just fine. 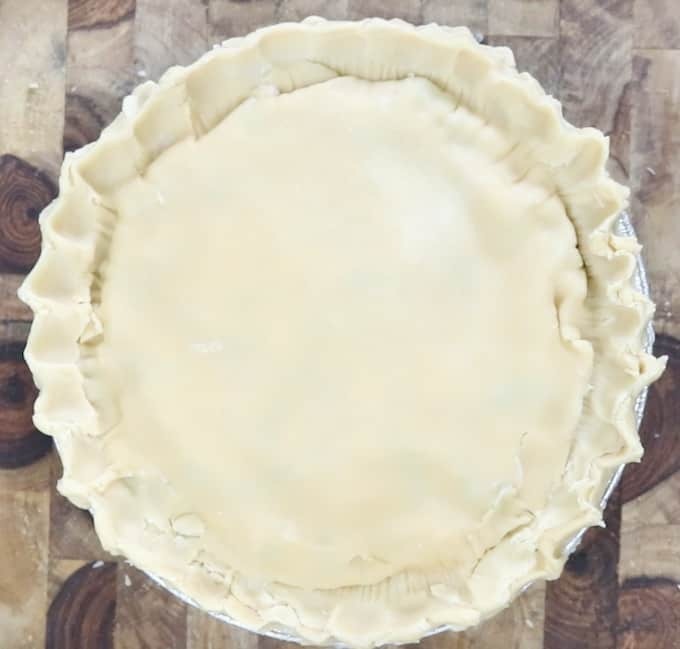 Kitchen Tip: If you are using the roll out pie crust variety, just make sure you let them sit out for a little while to warm up before unrolling or they will tear. Pinch the edges together and try to seal up any tears in the top of the crust. It doesn’t have to be pretty to taste amazing at the end! 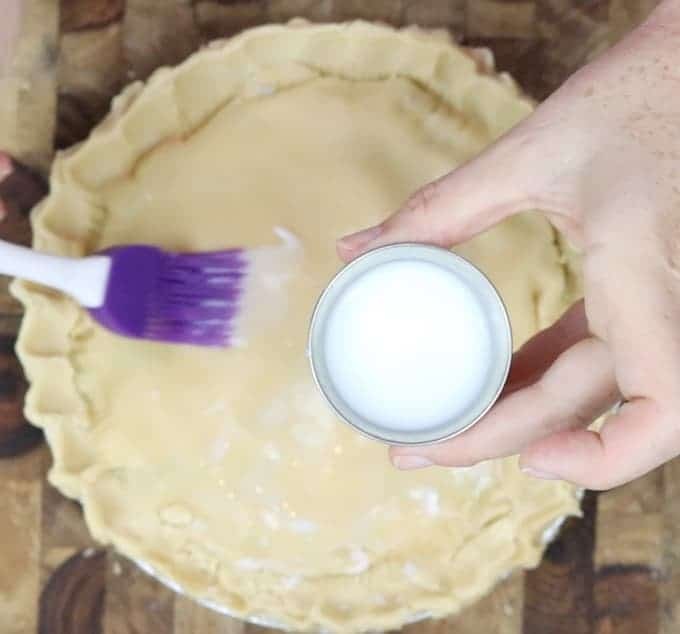 Kitchen Tip: If you want that shiny crust look when the chicken pot pie with pie crusts comes out of the oven, use a kitchen brush to brush milk over the top of the crust before baking. Bake at 400 degrees for about 30 minutes and dinner is served! While this is my daughter hands down favorite dinner, it’s working it’s way to the top of my list too. I’m pretty sure if you give it a try, you’ll agree! Bring mixture to a simmer and slowly whisk milk into the roux. For a shiny pie crust, brush with 1-2 tbsp. milk. Let pot pie sit for 5 -10 minutes before serving. 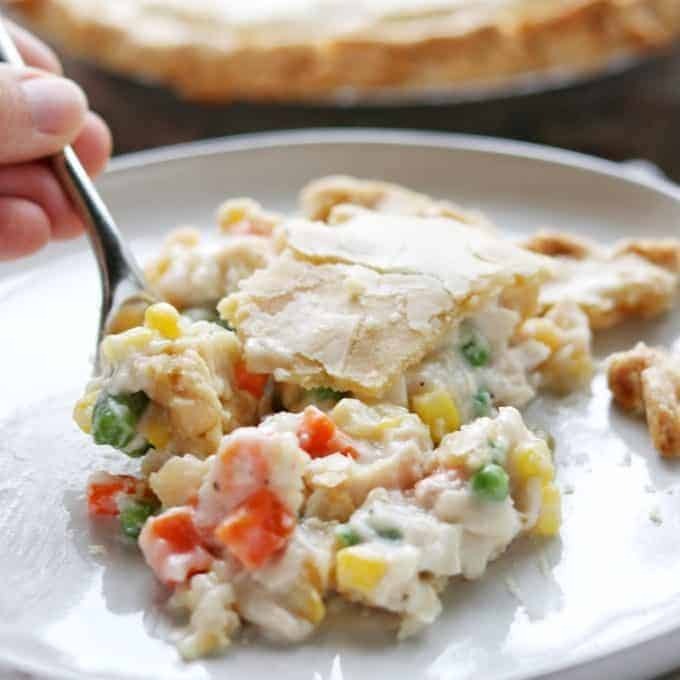 This chicken pot pie was so easy to make and was loved by every family member. Thank you for this recipe. I’ll be making it a lot!